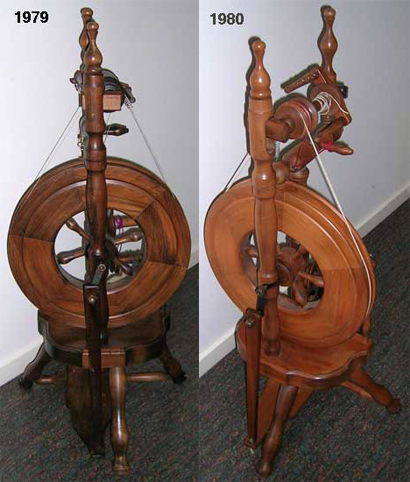 Little Peggy wheels are still used and loved all over New Zealand; there are quite a few in other countries but it is the Wee Peggy that is more widely travelled, because it came as an easily posted kit. The designs of the Peggies changed quite a bit over the years, in ways that are not always obvious at first glance. 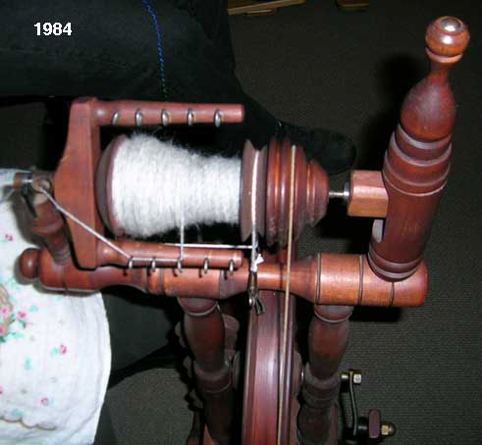 Most Little Peggies and some Wee Peggies are marked under the treadle or under the table with some numbers, handwritten in felt pen. The last two numbers are the year the wheel was made. However, some are unmarked. I hope this page will help Peggy owners to date their wheel and perhaps appreciate some of its features. 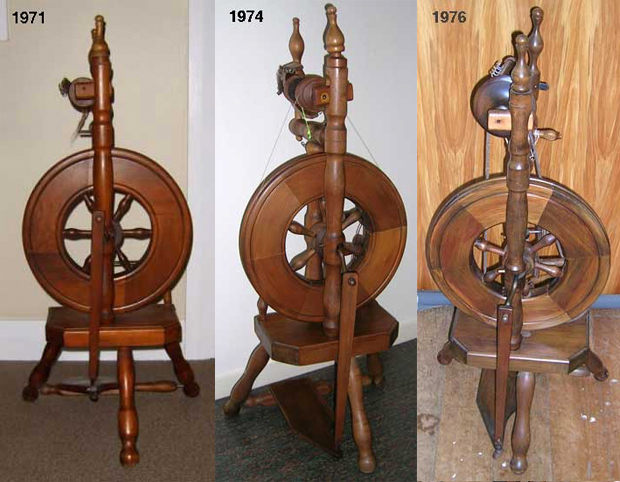 Please remember that the dates given are when the particular wheel was made, not necessarily the date of the change illustrated. It’s not possible to date changes more precisely. I compared a series of five Little Peggies (and one Wee Peggy which will be shown below). A few differences are clear already. 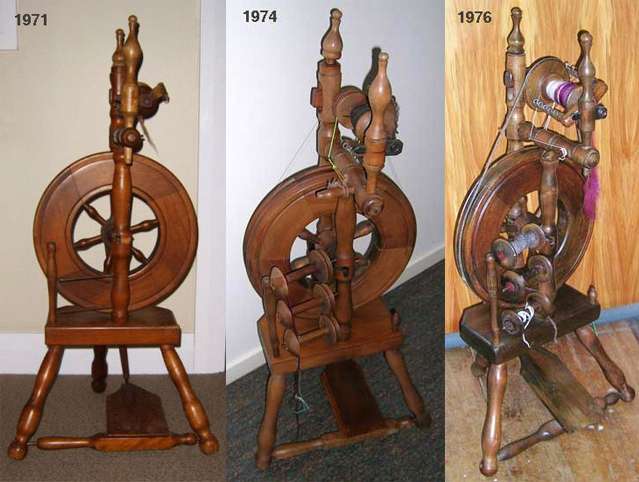 The 1971 wheel has a wider treadle than all the others, and the shape of the wheel segments is most unusual. The turned grooves around the side of the drive wheel change after 1974. 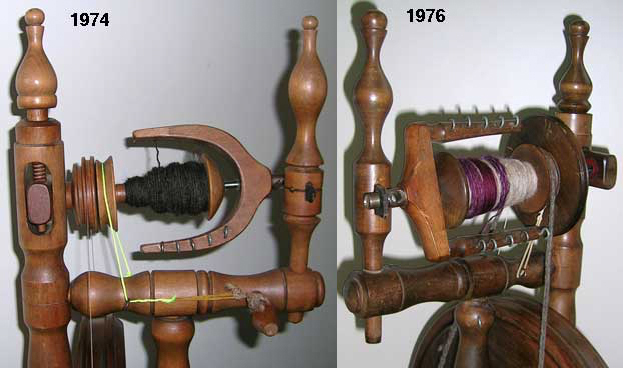 Up to 1976 the bearings for the flyer shaft are on the right of the maidens; after that they are on the left. After 1976 the shape of the table also changes, from a simple squared-off design to one with more elegant curves. The change in the flyer is very obvious. Maria Rappard told me that the more traditional one-piece flyer was too easily broken, and also used more wood than the three-piece flyer which was adopted by 1976. In the earlier years the crank was part of the axle: just a couple of bends and a screw cap to hold the top of the footman on. This must have made the wheel awkward to package when it was broken down for shipping, since the wheel was actually assembled around the axle – the axle cannot be readily tapped out to replace it, as with some wheels. 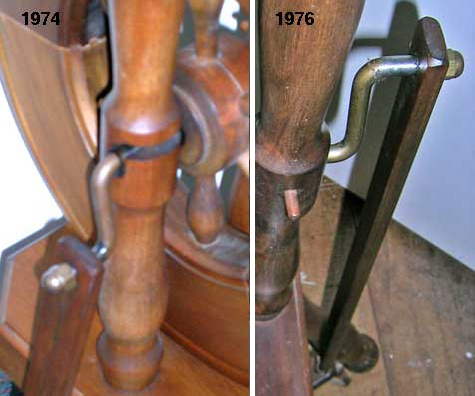 By 1979 the axle is only an axle, with a separate, shaped crank held on by a nut. 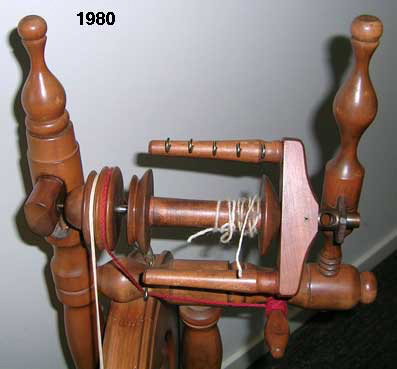 Another change between 1976 and 1979 is in the way the segments of the wheel are joined together. Maria Rappard told me that the earlier type of joint was more apt to weaken, especially in the dry atmosphere of a centrally-heated house. The later “finger joint” offers more surface for glueing and holds more firmly. 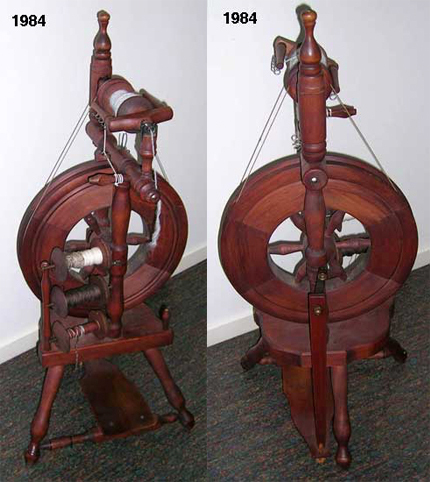 This late Wee Peggy demonstrates how Wee Peggy differs from Little Peggy: the flyer assembly is central over the wheel, with the orifice resting on top of a truncated front maiden, which would have made it easier and safer to ship across the world. 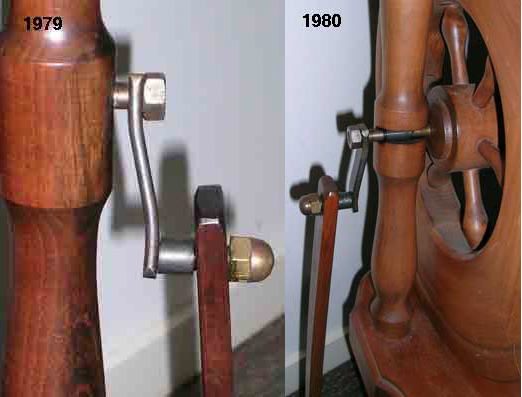 Apart from that, its details are exactly what we have seen in the late Little Peggy – the more elaborately shaped table, the 3-piece flyer, the separate crank, and (barely visible in the third photograph) the finger-jointed wheel. 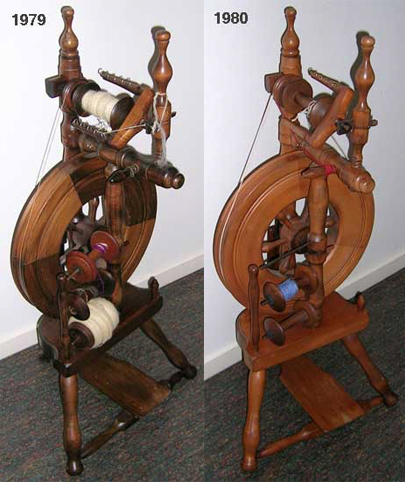 It’s interesting to see how a good maker of spinning wheels is constantly thinking about improvements that will make his wheels better and more durable.